Sasha smooched an elephant and didn’t even realize it, but I’m getting ahead of myself. Traveling through Thailand images of elephants bedeck beer bottles, billboards and buildings. They are icons that are almost universally revered throughout the country and literally worshipped by some. However, over the last 100 years wild elephants in Thailand have dropped in numbers from over 100,000 to just 2,500 largely due to deforestation and poaching. The one upside is that now, because they’re endangered, wild elephants are protected in Thailand. They’ve stopped the worst of the deforestation and done their best to put an end to poaching. Domesticated elephants are a different story. There are approximately 2,500 domesticated elephants left in Thailand. There used to be more, but when they halted the mass deforestation that was happening (a good thing) they put most of them out of work. Some were abandoned in the forest, because families couldn’t afford to feed them. Others were put to work on farms, but most went to work in the tourism industry. To be fair, tourism likely saved these elephants lives, but as we learned about it I couldn’t help but feel a strange disconnect. Wild elephants are a protected national icon, but domesticated elephants share the same protections as a chicken, which is to say none. From the perspective of an elephant some tourist places are bad, some neutral, some good. But we weren’t sure which was which and decided to do some Googling. 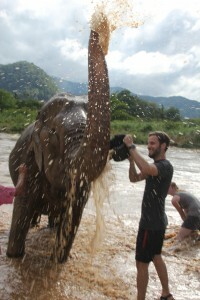 Sasha found the Elephant Nature Park outside of Chiang Mai. It was started by a local woman, Lek, who took in a few elephants that were blinded, disabled or so depressed they weren’t eating. She bought them from their owners and nursed them back to health. A guy from Texas, now referred to as Mr. Texas, was so inspired by her work that he gave her the funds to buy more land and elephants. Today she runs an ecotourism program that pays for itself and protects over 40 elephants – each one a product of abuse, neglect or both. Sasha and I spent the day feeding and bathing them. We watched them play in the river, scratch endless itches, and throw dirt on their back for a little protection from the sun. At the end, Sasha got a bit more than she bargained for when an elephant that didn’t know she was taken, ehem, planted one right on her face. Technically, it was it’s trunk, but I know what was going on. Protect your woman, i say!! Man UP! lol how cute and cuddly they are–but I think she still prefers you! Whew. These are so wonderful….of all of you! Delightful and very touching. WOW! They seem so tame. I’d be terrified! Wonderful pics tho. Thanks. Thanks Kim. 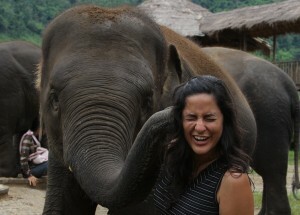 They are surprisingly gentle, but I was a little scared and taken aback when it started feeling my face with it’s trunk. Wasn’t expecting it! I am really glad that you guys found this place – it is one of my all time favourites!!! That isn’t an Eskimo kiss that is a “Wet Willy” — oooooo, Sasha, ick. Haha! You are so right. I love the photo of Sasha getting trunk love. Priceless. I think we could work out a price.